The 7 Best Delis in Wyoming! Wyoming is home to unique, down-home-style delis that you just won’t find in other parts of the country. The Eastern European tradition of charcuterie and delis has flourished in the Equality State. From upscale sandwich shops to mom and pop-style counters, here are the best delis in Wyoming. The Moose is Rocky Mountain through and though. It’s rugged and nature-based, emphasizing local, fresh and approachable, while still being responsibly-sourced and keeping-up with the modernizing tastes of today’s diner. While it’s breakfast sandwiches are top-notch with a cup of coffee (they’re served all day), the lunch options are stellar. The wraps and hot sandwiches are mounded high and warm the belly, but the seasonal options keep the palate entertained. The Bacon & Bleu Mo’ is a timely indulgence: beef, bacon and bleu cheese. The no-frills stools and checkerboard floor are immediately welcoming. Celebrating its third decade in the competitive Jackson Hole culinary scene. Evolved from its prior take-out only operation, local art now decorates its walls and tables welcome a welcomingly prolonged eating experience. The impressive sandwich menu sports a host of classic and creative options, all named after NYC hallmarks. The “Staten Island” is a heaping meatball sub with provolone and marinara; or try the “Brooklyn,” a stack of layered fresh and pickled veggies. The Jackson Hole and Wilson areas are rather competitive, as far as the culinary scene goes, held to the standards of its often-demanding tourists and seasonal residents, and the unmatched majesty of the surrounding wilderness. But for over 20 years, the delis at these sister markets, Pearl Street and Aspen, has carved-out a food niche, mostly due to its following-through on fresh, local-as-possible ingredients. The bread (baked locally) is a chewy and airy canvas for any delicious sandwich combination. Crowd pleasers include the Caprese and Veggie, and the French dip or Cubans are hot and melty. A late-1800s family heirloom, this community cornerstone has evolved from trading post to purveyor of quality meats to deli. The small operation means the friendliest and most attentive service, but even more importantly, this ensures an attention to detail: dang good ingredients that comprise some mouthwatering tortas. This family unit provides a one-stop shop: purchase a few pounds of just-sliced meats and cheeses (from buffalo summer sausage to Amish softs), pick-up some house-made salads, or assemble a customized sandwich (at the “Saloon”). Standout combinations are the Blue Roast Beef (heaped with local beef and buttermilk bleu) and the Cuban (the classic cheesy-briny-savory milieu, pressed crispy). This sleek and modern product of the organic, locavore explosion provides a very polished and satisfying grocery experience. Great products, all relatively guilt-free (environmentally, anyways), served by passionate people dedicated to community and quality food. And within this nearly 30-year-old business, the cafe produces some delectable, well-made deli creations. Two behemoth, meat-centric items impress: “The New Yorka” (pastrami, kraut and good mustard) and the bahn mi (that delicious, baguette-wrapped porky-ness of Vietnamese import). This wooden storefront is straight out of a Universal Studios western set. The genuine old style saloon vibe permeates the demeanor and approachability of the staff, making for a casual and plain delicious, deli experience. There’re certainly no-frills here. The menu is simple, straightforward and familiar: things like BLT, PB&J, turkey, roast beef and all the usual cheeses. But these uncomplicated ingredients are executed well, which, when combined with its small-town comfortability, makes for a truly satisfying (and affordable!) lunch experience. Yes, it’s a bagel joint. But, come noon, its sandwiches and house-cut deli meats take the stage. An onion bagel topped with roasted turkey, melted Swiss, rings of red onion and a bouffant of sprouts: it’s hard to pass up. Especially when the bagels are baked fresh daily, and the ingredients are diverse, seasonal and regional. Frankly, given the handmade, additive-free deliciousness of theses bagels, the “Beyond” isn’t necessary. Twenty, yes, 20 varieties of bagels are available, all primed for toppings, meats, or a simple toasting. And lunchtime here is as worthwhile as the breakfast. 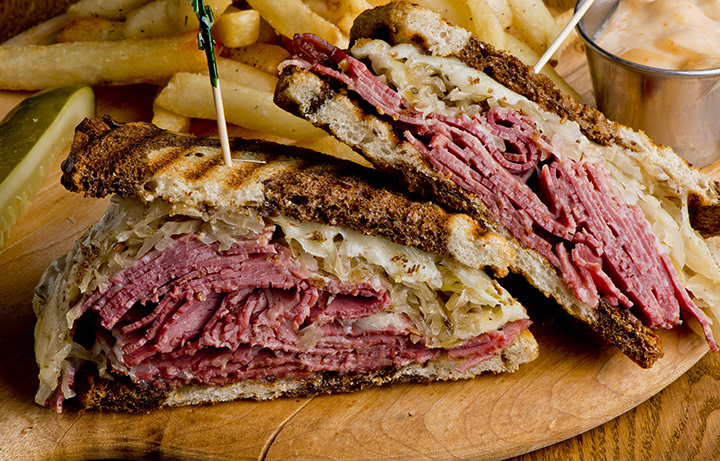 Try the classic BLT or Reuben.